The Sikorsky S-92 is an American twin-engine medium-lift helicopter built by Sikorsky Aircraft for the civil and military helicopter markets. The S-92 was developed from the Sikorsky S-70 helicopter and has similar parts such as flight control and rotor systems. The H-92 Superhawk is a military version of the S-92 in the utility transport role, capable of carrying 22 troops. The H-92 can also be configured for specific missions, including search and rescue and executive transportation. The CH-148 Cyclone is a shipboard maritime helicopter variant under development for the Canadian Forces. The Sikorsky VH-92 is a variant under development to replace the United States Marine Corps' Marine One U.S. Presidential transport fleet. After the 1973 oil crisis, major oil and gas companies began exploration further offshore, thus creating a need for aircraft such as the S-92 with sufficient capability. Sikorsky Aircraft first displayed a S-92 mockup of the planned helicopter in 1992. The S-92 was to be offered for sale beginning in 1993, but due to a decline in the international market for helicopters, this was delayed. In 1995 Sikorsky formed Team S-92 with international partners and launched the helicopter program at the Paris Airshow that year. Sikorsky developed the S-92 to compete with civil aircraft such as the Aerospatiale/Eurocopter Super Puma. The helicopter uses a new airframe with dynamic components based on the S-70/H-60 components. The S-92 took its maiden flight on December 23, 1998 at the Sikorsky Development Flight Center, West Palm Beach, Florida. In July 2000, Sikorsky announced design changes to the S-92. The fuselage of prototype #3 was lengthened by 16 in (40 cm) aft of the cockpit, the tail pylon was shortened by 41 in (1.04 m), and the horizontal stabilizer was repositioned from the left side opposite the tail rotor to the right side at the base of the tail pylon. The modifications to the tail solved a pitch stability issue discovered during flight testing, and were reported to allow the aircraft to meet a key requirement of the Nordic Standard Helicopter Program (NSHP) for shipboard stowage. The lengthening of the fuselage and shortening of the tail pylon shifted the aircraft center of gravity (CG) forward, permitting a more level attitude in flight. The longer fuselage allowed for an additional row of three seats, as well as a larger passenger door option for Search and Rescue (SAR) customers. Sikorsky incorporated the changes into the following two prototypes as the production standard configuration. Some reports suggested that the modifications were actually to resolve damage from structural design flaws. The S-92 is built and customized in Sikorsky's Coatesville, Pennsylvania facility. The S-92 received Federal Aviation Administration (FAA) part 29 type certification on December 19, 2002, and received International European Aviation Safety Agency/Joint Aviation Authorities (EASA/JAA) certification on June 8, 2004. In June 2009, Sikorsky Aircraft entered into a joint-venture with Tata Advanced Systems for S-92 manufacturing in India for export and domestic markets. A US$200 million manufacturing plant will be operational in Hyderabad by 2010. Initially, TASL will supply the complete cabins for the S-92 to Sikorsky. The first cabin was delivered in November 2010. The S-92 is multi-purpose helicopter powered by twin GE CT7-8A turboshaft engines and has an aluminum airframe and some composite components. The four-bladed fully articulated composite main rotor blade is wider and has a longer radius than the Sikorsky S-70. The tapered blade tip sweeps back and angles downward to reduce noise and increase lift. Most of the rotor system components aside from the blades are titanium. The S-92 features an active vibration control system, using vibration sensors and structurally mounted force generators to increase flight comfort and lower acoustic levels to below certification requirements. 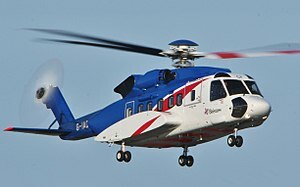 A 2008 study by Norway's Flymedisinsk Institute found that the S-92's vibration levels were 42 percent above that of the Eurocopter EC225 Super Puma; Sikorsky disputed this finding, saying that the study hadn't used their latest anti-vibration technology. In February 2011, the noise and vibration levels were reportedly subject to health concerns, allegedly causing tinnitus and heart problems. A number of safety features such as flaw tolerance, bird strike capability, and engine burst containment have been incorporated into the design. Adherence to FAA FAR part 29 has led the FAA certification board to call the S-92 the "safest helicopter in the world". The S-92 reportedly met the FAR part 29 "run dry" requirement by asserting the loss of oil pressure in the main gear box is "extremely remote". The S-92 received FAA certification in 2002, and International certification in June 2004. The first S-92 was delivered in late 2004 to launch customer PHI, Inc.
Sikorsky entered a Search and rescue variant of the H-92 in U.S. Air Force's CSAR-X combat search and rescue competition beginning in 2006. Its competitors were the AgustaWestland EH101 and HH-47, but by December 2012 all other manufacturers had withdrawn. Flight International magazine expects Sikorsky to bid a version of its MH-60 special operations helicopter. After Sikorsky successfully challenged in court the preferred supplier status of NHIndustries NH90 for the Nordic Standard Helicopter Programme an open competition was held. Sikorsky entered the S-92 as a candidate for the Norwegian All Weather Search and Rescue Helicopter (NAWSARH) that is planned to replace the Royal Norwegian Air Force Westland Sea King Mk.43B in 2015. The other candidates for the NAWSARH contract of 10 to 12 helicopters were AgustaWestland AW101, Bell Boeing V-22 Osprey, Eurocopter EC225, and NHIndustries NH90. The V-22 was eliminated from the competition in 2012. The S-92 was removed from the competition in July 2013 and was subsequently won by AgustaWestland with an order for 16 AW101s. The S-92 competed with the Eurocopter EC225 for the UK Search and Rescue – Helicopter (SAR-H) program. In February 2010, the S-92 was selected by the UK in a £6bn deal to replace 40 Sea King search and rescue helicopters with 25 to 30 S-92s; it subsequently announced that Soteria, the preferred supplier, will not be used due to irregularities with its bid. The UK government subsequently opted for a smaller £2.5bn contract with the Bristow Group to operate 11 S-92s (and 11 AW189s) from 10 bases. The Irish Coast Guard is replacing its Sikorsky S-61N fleet with the S-92. First aircraft was delivered on 29 January 2012. The aircraft are operated by CHC Helicopter. In the wake of the deadly 2016 crash of a Eurocopter EC225 Super Puma contracted by Statoil, that company announced that it would not use that type again and instead use the Sikorsky S-92 to meet its needs, stipulating that operators it contracts with, such as CHC Helikopter Service, will be required to use such equipment. The S-92A is the civilian variant and is available in a number of versions. The civil transport version has an airliner-type interior which seats 19 passengers. The utility transport version has 22 side-facing seats with a full cabin width rear ramp. The 733 sq ft (68.1 m2) interior cabin area can also be configured to accommodate up to three airline-style LD3 cargo containers. Additional stowage space is available in the 140 sq ft (13 m2) area located in the aft ramp compartment. During development it was referred to as the S-92C Helibus. The H-92 Superhawk is the military variant of the S-92. It has been demonstrated to the U.S. Air Force, Marine Corps and Coast Guard. The H-92 has more powerful GE CT7-8C engines, rated at 3,070 shp (2,290 kW) and, unlike the S-92, has fly-by-wire flight controls. The search and rescue variant provides space for seats, litters, auxiliary fuel cell and SAR emergency equipment. In July 2004, the H-92 Superhawk was selected by Canada for its Maritime Helicopter Programme (MHP) as the CH-148 Cyclone. Canada ordered 28 helicopters in November 2004. The program has been delayed multiple times. Babcock Mission Critical Services Currently operating 14. On July 19, 2008, an S-92 carrying Rev. Sun Myung Moon crashed in South Korea. The helicopter was flying in inclement weather which forced it down on a hillside. The 16 people aboard were slightly injured in the crash. On March 12, 2009, Cougar Helicopters Flight 91, an S-92A operated by Cougar Helicopters carrying 18 passengers and crew en route to oil platforms off the coast of Newfoundland, crashed and sank in 170 meters (560 ft) of water during an attempted ditching. One person was rescued from the North Atlantic with serious injuries and the others did not survive. The crash was determined to be caused by 16 separate factors that led to the fatal crash but no single one was to blame. On December 28, 2016, a S-92 (registration G-WNSR, serial number 920250) operated by CHC Helicopter experienced "unexpected control responses" whilst in mid-air on a routine shuttle flight between two oil installations in the North Sea. The pilots conducted an emergency landing on the West Franklin platform. The helicopter is reported to have spun on the helideck during the landing, damaging the helicopter wheels and rotor blades. The helideck also sustained damage during the emergency landing. There were no reported injuries amongst the nine passengers and two crew during the incident. The aircraft was transported back to Aberdeen via ship, at which time the Air Accidents Investigation Branch began their investigation into the incident. Sikorsky issued a notice on January 9, 2017 grounding all S-92 aircraft until the tail rotors have been inspected. The inspection work takes approximately 11 man hours to complete. The Air Accidents Investigation Branch issued an update on January 11, 2017 which reported that the tail rotor pitch change shaft bearing had seized. The bearing showed signs of severe overheating and significant wear. The failure of the bearing allowed the tail rotor driveshaft to damage the tail rotor servo. The damage to the tail rotor servo is considered to be the cause of the loss of tail rotor control. The health and usage monitoring systems had discovered the flaw the day before flight, but the maintenance crew had not. On March 14, 2017, a S-92 operated by CHC Helicopter under contract to the Irish Coast Guard crashed off the west coast of Ireland with four crew members on board. Three of the crew were initially missing. Captain Dara Fitzpatrick was recovered from the water but later died in hospital. The helicopter crashed into an unmapped island in poor weather. The helicopter fuselage was located. Captain Mark Duffy's body was recovered in the helicopter's cockpit on March 26. Rotor systems: Main rotor has 4 blades. From the main gearbox a set of driveshafts connect to the tail gearbox to turn the 4-blade tail rotor. ^ "SIKORSKY DELIVERS PRODUCTION NUMBER 300 S-92® HELICOPTER TO ERA GROUP INC". news.lockheedmartin.com. ^ Kay, Marcia Hillary. "40 Years Retrospective: It's Been a Wild Ride" Rotor & Wing, August 1, 2007. Accessed: 8 June 2014. Archived on 8 June 2014. ^ a b Frawley, Gerald. "Sikorsky S-92 Helibus". The International Directory of Civil Aircraft, 2003/2004. Aerospace Publications, 2003. ISBN 1-875671-58-7. ^ a b Donald, David, ed. "Sikorsky S-92". The Complete Encyclopedia of World Aircraft. Barnes & Nobel Books, 1997. ISBN 0-7607-0592-5. ^ Frawley, Gerald. "Sikorsky S-92". The International Directory of Military Aircraft, 2002/2003. Aerospace Publications, 2002. ISBN 1-875671-55-2. ^ Lewis, Jeff. "All aboard the S-92". Flight International. 25–31 July 2000. Accessed on 7 November 2008. ^ Lake, Jon, editor. "Type Focus: Sikorsky S-92" Archived December 11, 2008, at the Wayback Machine. RotorHub. Shepard Publishing. October–November 2007. p. 19. Accessed: 8 November 2008. The article suggests that reasons for the design modifications on the S-92 were the result of cracking on the tail pylon and stabilator based on reports from unnamed industry sources. ^ a b Searles, Robert A. "A Truly New-Generation Helicopter". Aviation Week's Sporlight, June 2003. ^ a b "Sikorsky S-92 Achieves International Type Certification". Sikorsky, June 8, 2004. ^ "Tata-Sikorsky Deal Ends HAL Aerospace Monopoly"[permanent dead link]. Defense News, June 3, 2009. ^ "Tata Advanced Systems and Sikorsky to Manufacture Helicopter Cabins in India". machinist.in, June 16, 2009. ^ "Business briefs". Retrieved November 10, 2010. ^ North, David M. "S-92 Update and Pilot Report" Archived April 29, 2011, at the Wayback Machine. Aviation Week, September 28, 2003. ^ Cheny, Peter. "Newfoundland company orders S-92 pilots to remain below 7,000 feet." Globe and Mail, 14 May 2009. ^ "This helicopter makes pilots ill". Dagbladet, February 7, 2011. ^ "Many pilots report ruined health". Dagbladet, February 12, 2011. ^ "Superhawk may succeed Nuri" Archived December 12, 2007, at the Wayback Machine. NST Online, December 12, 2007. ^ "Doomed helicopter failed vital safety test, files reveal" Archived April 10, 2009, at the Wayback Machine. Globe and Mail online, April 6, 2009. ^ "Connecting Sikorsky's Commercial Network". Sikorsky, July 2005. ^ Our Fleet. PHI, Inc.
^ "Sikorsky Is Sole Bidder in Helo Contest." Defense News, December 18, 2012. ^ Majumdar, Dave. "Sikorsky last bidder standing in USAF's combat rescue helicopter battle". Flight International, December 12, 2012. ^ a b "AW101 Flies off With Norways SAR Helicopter Competition". ^ "The NAWSARH Project". Royal Norwegian Ministry of Justice and the Police. Archived from the original on June 7, 2011. Retrieved June 6, 2009. ^ Per Erlien Dalløkken (May 7, 2009). "De fem kandidatene". Teknisk Ukeblad (in Norwegian). Retrieved June 6, 2009. ^ "Candidates that have passed the Pre-qualification process for delivery of future SAR helicopters for Iceland and Norway". Royal Norwegian Ministry of Justice and the Police. n.d. Archived from the original on December 9, 2012. Retrieved February 26, 2012. ^ "SAR-H bidders announce helicopter types". Shephard Group. March 11, 2009. Archived from the original on July 25, 2009. Retrieved June 6, 2009. ^ Wilson, Amy (February 10, 2010). "RBS group wins £6bn helicopter PFI". The Daily Telegraph. London. Retrieved May 23, 2010. ^ "Helicopter bid process is halted". February 8, 2011 – via www.bbc.co.uk. ^ Group, Bristow. "Latest News - bristowgroup.com". Bristow Group. ^ "Sikorsky-S-92A". ©Copyright 2012 Demand Media, Inc. Retrieved December 11, 2012. ^ a b "Statoil drops Airbus Super Puma helicopters for good". Reuters. December 6, 2016. Retrieved December 6, 2016. ^ "Government of Canada Awards Contracts to Sikorsky for New Canadian Forces Maritime Helicopter". Canadian Forces news, November 23, 2004. ^ "Canada's CH-148 Cyclones: Better Late Than Never?". Defense Industry Daily, July 21, 2013. ^ "Frota Off-Shore". lideraviacao.com.br. Retrieved September 7, 2016. ^ "Brunei Shell Petroleum Purchases Three S-92s". thefreelibrary.com. Retrieved January 29, 2013. ^ "CHC Fleet". chc.ca. Archived from the original on February 13, 2013. Retrieved January 29, 2013. ^ "Cougar Heli". cougar.ca. Retrieved January 29, 2013. ^ "AIRSHOW CHINA: China Southern orders two Sikorsky S-92s for oilfield support". flightglobal.com. Retrieved January 29, 2013. ^ "Sikorsky-S-92A". Demand Media, Inc. Retrieved December 11, 2012. ^ "Bristow Helicopters" (PDF). bristowgroup.com. Retrieved January 29, 2013. ^ "Bristow S-92". Demand media. Retrieved January 31, 2013. ^ "CHC Helicopter fleet". no.chc.ca. Archived from the original on April 1, 2014. Retrieved May 2, 2016. ^ "Gulf Helicopters fleet". gulfhelicopters.com. Retrieved May 8, 2014. ^ "Bristow Helicopters fleet". bristowgroup.com. Retrieved March 20, 2013. ^ "PHI fleet". phihelico.com. Archived from the original on October 6, 2014. Retrieved October 1, 2014. ^ "Sikorsky Announces S-92 VIP Helicopter Sale to Azerbaijan Airlines". Sikorsky Aircraft Corporation. Archived from the original on December 11, 2013. Retrieved January 29, 2013. ^ "Bahrain International Airshow 2010". aeroresource.co.uk. Retrieved January 29, 2013. ^ "Irish and Korean Coast Guards State their Case for the S-92® Helicopter". lockheedmartin.com. December 21, 2011. Retrieved September 18, 2017. ^ "Sikorsky-S-92A". Demand Media, Inc. Retrieved October 5, 2014. ^ "Police Air Units". J-HangarSpace (Paul Thompson). Retrieved March 15, 2017. ^ "World Air Forces 2014" (PDF). Flightglobal Insight. 2014. Retrieved September 20, 2014. ^ "Large helicopter fleet deployed for Haj security". saudigazette.com.sa. Archived from the original on December 11, 2013. Retrieved January 29, 2013. ^ "Sikorsky Delivers Three S-92 Helicopters to Korean Air Force". Aero-News.net. Retrieved January 11, 2015. ^ "Korea Coast Guard signs for S-92". Helihub.com. Retrieved December 6, 2012. ^ Dominguez, Gabriel (June 28, 2017). "South Korean coastguard receives second S-92 helicopter". IHS Jane's 360. Archived from the original on July 1, 2017. Retrieved July 1, 2017. ^ "Royal Thai Air Force". helis.com. Retrieved December 11, 2012. ^ "Turkey Signs for Head-of-State Sikorsky S-92". Sikorsky Aircraft Corporation. Retrieved January 29, 2013. ^ "Turkmenistan Purchases Two VIP S-92 Helicopters". Sikorsky Aircraft Corporation. 2012. Retrieved December 11, 2012. ^ "United Kingdom Coast Guard Aviation". Aeroflight. Archived from the original on July 25, 2009. ^ "Moonies founder 'hurt in crash'". BBC, July 19, 2008. ^ "Rev. Moon Hurt in Copter Crash". Newser, 19 July 2008. ^ Unification Church founder Sun Myung Moon, 15 others injured in helicopter crash, International Herald Tribune, 19 July 2008. ^ "No signals from locater beacons on suits worn by oil workers: officials". CBC News. March 12, 2009. Retrieved March 12, 2009. ^ "AVIATION REPORTS – 2009 – A09A0016 – Occurrence Summary – Main Gearbox Malfunction/Collision with Water Cougar Helicopters Inc. Sikorsky S-92A, C-GZCH St. John's, Newfoundland and Labrador, 35 nm E 12 March 2009". Transportation Safety Board of Canada, 2010. Accessed: 26 November 2011. ^ Croft, John. "TSB: Cougar S-92 experienced tail rotor drive failure". Flightglobal.com, 22 June 2009. ^ "Inquiry finds 16 separate problems in 2009 Nfld. helicopter crash".The Globe and Mail, 9 February 2011. Access date: 9 February 2011. ^ "GINFO Search Results". Civil Aviation Authority (United Kingdom). January 9, 2017. Retrieved January 10, 2017. ^ a b Burns, Niamh (December 30, 2016). "Helicopter 'spun on platform deck' in emergency landing". Energy Voice. DC Thomson. Retrieved January 10, 2017. ^ a b Lammey, Mark (January 5, 2017). "Fresh pictures emerge showing aftermath of North Sea helicopter emergency landing". Energy Voice. DC Thomson. Retrieved January 10, 2017. ^ "North Sea helicopter 'gouged platform deck'". BBC News. BBC. January 5, 2017. Retrieved January 10, 2017. ^ "Sikorsky grounds S92 helicopters for safety checks after incident". BBC News. BBC. January 10, 2017. Retrieved January 10, 2017. ^ "AAIB Bulletin S1/2017 SPECIAL" (PDF). Air Accidents Investigation Branch. January 11, 2017. Retrieved January 12, 2017. ^ "Irish coastguard head says hopes 'fading fast' for missing helicopter crew". BBC News. March 14, 2017. Retrieved March 14, 2017. ^ "Wreckage of Rescue 116 found off Mayo coast". March 22, 2017. ^ McSorley, Anita (March 29, 2017). "Tragic Coast Guard Captain Mark Duffy's funeral details announced". ^ , Sikorsky S-92 Multimission Brochure, p.20, Retrieved March 15, 2011. Leoni, Ray D. (2007). Black Hawk: The Story of a World Class Helicopter. American Institute of Aeronautics and Astronautics. ISBN 978-1-56347-918-2. Wikimedia Commons has media related to Sikorsky S-92.